Sibindi, the Virginia Zoo’s new male White rhino, arrived this weekend from White Oak in Florida. The 11-year-old male joins two females, Bora and Zina, in the Africa – Okavango Delta. Photo provided by Virginia Zoo. The Virginia Zoo is excited to welcome a male rhino. The 11-year-old male, Sibindi, arrived at the Zoo this weekend from White Oak Conservation Center in Florida and will take residence in the Africa – Okavango Delta with Bora and Zina. The international Species Survival Plan (SSP) designated Sibindi as a prime male to join the Zoo’s two female White rhinos. Bora and Zina came to the Zoo earlier this year from the Singapore Zoo and have a gene pool that is new to the United States. Sibindi has spent the last eight years at White Oak, a leading global organization for the conservation of endangered species and is known to be fertile. Sibindi weighs approximately 3,800 pounds and stands almost six feet tall. There are two subspecies of white rhino, both of which are critically endangered. In the 1960s there were more than 70,000 African rhinos in existence. Today, there are fewer than 20,000 White rhinos. Visitors to the Virginia Zoo can see Sibindi from the windows inside the rhino barn. However, he will be in quarantine for 30 days. During this quarantine and familiarization time, he will be under observation by our veterinarian, Vet Tech and Zoo Keepers to make sure he is healthy and happy. 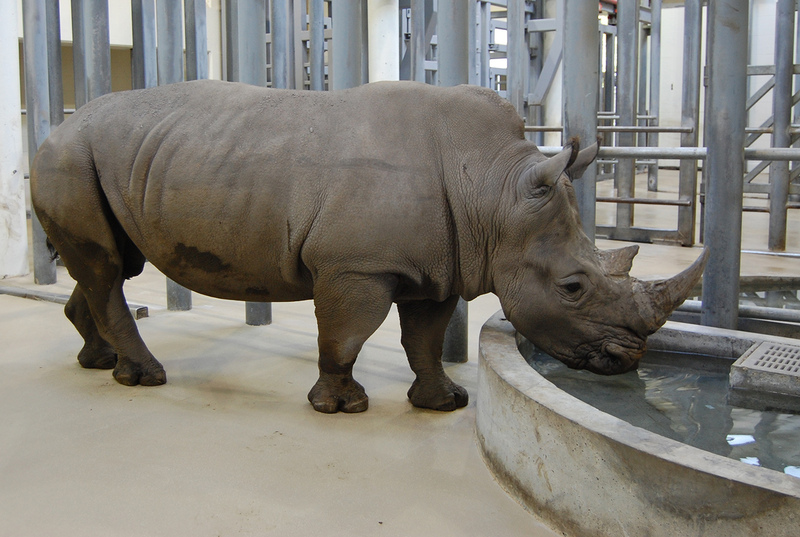 After Sibindi has completed quarantine, he will gradually be introduced to the outside exhibit and Bora and Zina. The Virginia Zoo, located in Norfolk, Virginia is home to more than 500 animals representing over 100 different species. Founded in 1901 and residing on 53 landscaped acres in Lafayette, the Virginia Zoo has demonstrated a commitment to education and conservation for more than a century. The Virginia Zoo is an accredited member of the Association of Zoos and Aquariums. Visit www.virginiazoo.org or call (757) 441-2374 for more information. Tags: Association of Zoos and Aquariums, Norfolk, rhino, Sibindi, Virginia, Virginia Zoo, white rhino, Zoo. Bookmark the permalink.